I have a Zone 1 Yearly Commuter Club Myki, so I don’t normally need to touch-off, but I have been doing so, in order to gather data on train punctuality. Each trip is recorded, with its start and end station, and the time down to the exact second, and can be viewed via the Myki web site. Over the past month or so (43 trips) I’ve fed this information into a spreadsheet, and compared it to the scheduled train times. I’ve only included trips on the Frankston line (or to be precise, on the Caulfield lines), and also recorded the type of train, to see if the well-known Siemens braking problem (and subsequent speed restrictions when approaching stations with a level crossing beyond them) is affecting punctuality. The times were further split into peak (which I decided meant into the city 7am-9:30am, out between 3pm and 7pm) and off-peak (all other times, including weekends) — the morning hours are slightly different from official definitions, but my view is the system is still quite busy between 9am and 9:30am. 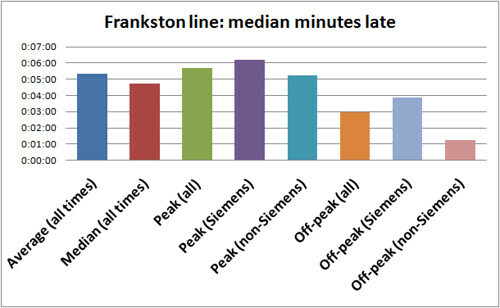 The overall average figure of 5 minutes 20 seconds late underscores that the Frankston line continues to be the official worst for punctuality. The 12 month average of 69.6% arrivals within five minutes, compared to the network average of 86.0%. 23 out of 43 arrivals were 5 minutes or less late, making 53% meeting the loose government definition of “on-time”. It’s less than the 69.6% 12 month average figure, but most of my trips are in peak hour. Peak (5:41 late) is clearly more problematic than off-peak (2:57), no doubt due to more passengers loading and unloading, and more congestion due to higher-frequency train services. During peak, the Siemens vs non-Siemens issue does come into play to a certain extent, but perhaps not as much as one might think, at least not directly. This might be because there are a lot of trains running on the network, so even Comeng trains may be delayed due to Siemens trains. The Siemens vs non-Siemens delays in off-peak (eg when passenger loading and network congestion is less likely to be an issue) does appear to be a notable problem, though the sample size (8 trips) is somewhat smaller, and may not be reliable. The May timetable change includes putting Siemens trains on most Frankston line services, and adjusting the timetables to more accurately reflect their running times. I assume that means some trips are going to get a bit longer, but the punctuality will improve. After the change, I’ll have another go at tracking it to see how it’s gone. Next → Next post: London Underground shower curtain FTW! I commute on the Cranbourne line and most of the time we get Siemens trains. The slow arrival into a station must be adding at leat 5 mIns to my trips yet the timetable remains as it is. For the last 12 months since the new timetables were implemented, trains are consistently late. To me, the punctuality targets on my line at least are simply a pipe dream, even the Metro station attendant thinks the timetables are wishful thinking. Anyway, enough whining, keep up the nerdy work! Wow! The depth of your analysis is very impressive. I just whinge when my train is late, but you’ve got the proof! One thing I don’t understand, how come you don’t need to touch off at Benteigh on your way home? Won’t Myki assume you’ve gone all the way to Frankston and add on a zone 2 fare? If I was to contribute any data to this I would also need to subtract the 45 seconds I spend attempting to get the Myki reader to recognise my card. I just started using my yearly Myki this week. The station staff at Ormond were not clear on whether I did or didn’t need to touch off on my way home – looking at your old post, I will let them know that I don’t! A knowing smile came across my face when I saw this title – I did the same thing a couple of weeks ago using the touch-on times to see how late my bus had been running. @Roger, see the link. On a Myki Pass, if you touch-on in a zone covered by the Pass, you will not be penalised by a default fare if you don’t touch-off. @Liz, the official line is still “touch-on, touch-off”, eg you should. But in this case yes, if you don’t, you won’t get penalised. @Brendan, glad I’m not the only one! Yeah I’m definitely not doing it wrong. I used to be able to hold it near the reader for about 1-2 seconds and it would work. Now even if I take it out of my wallet, plaster it flat against the reader and hold it there, perfectly stationary, for five full seconds, I’ll get nothing. Eventually it does work, but it takes several attempts. It happens on all the readers I try, at stations and on buses. I’d say the card has broken internally, which is brilliant because it’s been kept in my wallet for 15 months and protected from any bending stresses. However, I’m not willing to gamble $10 of my money by sending it in for them to decide whether it’s actually faulty, and live without a ticket in the meantime. I’ll just run it down to zero balance and then get a few Metcards. Didn’t Metro also say that on time running was also affected by Comeng trains being slow? It is not noticeable to me but there are always very good reasons why trains are late. So… what, after I Touch On, I can’t do it again? I was stuck. Of course, I just went through by closely hugging someone else like a grotty fare evader, but it brings the question: what happpens if people don’t get through before the barrier closes? They can never get through again until they walk go to another station and touch off? Or just… jump the turnstyle, touch off, go through, Touch On again and walk through? Once again, Metcard wins. Like Footscray Station when they swing open the fence to let Metcard owners and fare evaders thruough. 3rd class MyKi users have to trudge down the station to the small opening, just to use their MyKi cards. what happpens if people touch on and then turn around and walk away? It would be interesting to see if those trains were on time when they left Frankston. @Jagger, the Melbourne Central station staff should have both touched you on, then off. Metcard will give you a similar error if you try to go through a gate it thinks you’ve already entered (though it might have a time limit on it). Having discovered what had happened, you could have asked the staff to touch you off… or leant across the gate and touched-off from the inside, then touched-on again. Tango is right; the gate will stay open for a while after you touch, closing once you go through. I don’t see why anybody would touch and then not proceed through the gate. Footscray may be one of those spots where they’ll later put in more Myki readers. Dunno. Given how busy it is, they probably should.